Here you will find informations about the GPSResults-program, which allows to evaluate GPS-data (trackpoints) with respect to the achieved speed, how you can read the measured data from your GPS, and how to download a free trial-version of the GPSResults-program. 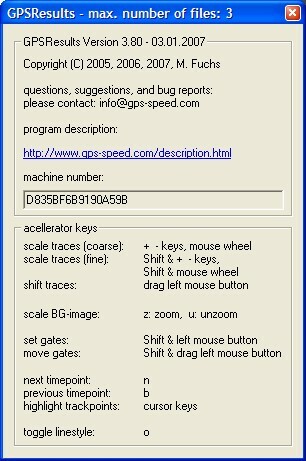 The GPSResults program can be used to calculate and evaluate the track-velocities from measured GPS-data. First of all the data (trackpoints) have to be read from your GPS, transferred to your computer, and saved as gpx-file. The trackpoints can be downloaded from the GPS directly using GPSResults (only for Garmin Geko 201, Foretrex 101 oder Foretrex 201: File - Download Trackpoints from GPS ...: select COM-Port, press Read Trackpoints and finally save as gpx-file). For the Garmin eTrex Legend C with USB interface there is also the option USB for a much faster download od the trackpoints directly via the USB-port. Don´t use this option if you use an USB-serial-adaptor! Alternatively the freeware program g7towin can be used (e.g. for GPS devices not supported by GPSResults), it can be downloaded from the internet. After starting GPSResults you can open and read one or several gpx-files that have been transferred from your GPS and saved using g7towin. In the File-menu click Open... and select the data files to be loaded. If several files shall be loaded select them sequentailly with the Ctrl-Button pressed or select a whole range with the Shift-button pressed (select last file first and then the first file of the range with the Shift-button pressed). Press the Open button after selection of the filenames. All selected files (four in this example) are loaded into the programm, the Trackpoints are displayed in the right panel and the evaluation is performed for all selected Tracks that are contained in the data files. Tracks can be selected/deselected in the uppermost section. The Tracks consist of Tracksegments which can be selected/deselected in the second section of the left panel. Interpolation: With this checkbox the selected track- or time-lengths will be interpolated exactly from the GPS-data, leading to more accurate and often slightly improved results. When Lin. Interpolation is switched off the track- or time-segments will be added conventionally until the selected value is reached. For example with 2sec measuring intervals the average of 6sec-segments will be used for the 5sec measure. The same is true for e.g. the 500m selection where the average over at least 500m will be used (the really travelled distance is displayed as second number in best five list). When Lin. Interpolation is switched on, the average speed of the exact track- or time-lengths is computed by linear interpolation of the first or last tracksegment, depending on which piece was the slower one. Thus, only as much as necessary of the slower interval is used. In most cases this leads to slightly better average speeds. Only in cases where e.g. the first and the last sections were faster then the middle sections, the conventional method gives better, but more inaccurate averaged results, since then the average of the longer distance is better than the average of the really wanted distance. Projection controls projection of the travelled distance to a straight line instead of using the really travelled distance for speed computations (with and without linear interpolation). Results in slightly slower speeds because the travelled distance is in general longer than the projected distance. Altitude With this checkbox the often rather inaccurate elvation measurements of the GPS can be ignored for the evaluation (mostly results in rather small differences). One/Leg: shows one result per run only. Run start and end are defined by velocities below 8knots (defined in the Limits-section) or direction changes larger than 90degrees in 20seconds (not possible together with Gates or Max.). min. Sats: minimum number of satellites (NMEA-data or GPX-data with these informations only). Invalid trackpoints are not considered during the evalution of speeds and are shown with a red background in the trackpoints-list. max. 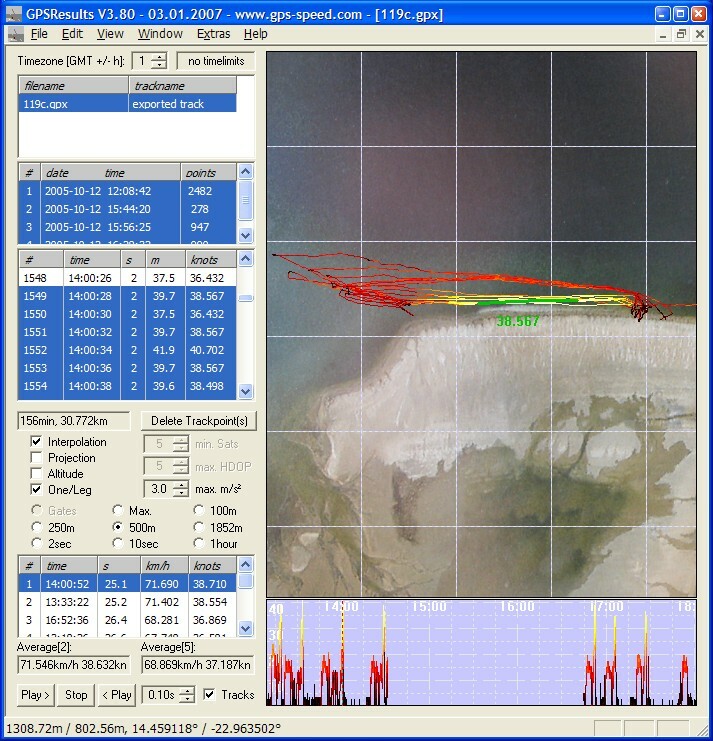 HDOP: maximum HDOP (horizontal dilution of position - NMEA-data or GPX-data with these informations only). Invalid trackpoints are not considered during the evalution of speeds and are shown with a red background in the trackpoints-list. max. m/s²: Maximum Acceleration [m/s²] determines the maximum allowed acceleration in m/s², it is useful to suppress outliers (spikes) in the GPS-data. The affected trackpoints will not be deleted, but just ignored during the speed computations. The default value of 3m/s² can be lowered until all spikes are vanished. Gates shows the best speeds within the gates for all trackpoints of the selected Tracks/ Tracksegments with the corresponding times. See below howto determine the gate positions. Max. shows the best speeds from all trackpoints of the selected Tracks/Tracksegments and the corresponding times. 100m / 250m / 500m / 1852m shows the best speeds over at least 100m/250m/500m/1852m from all trackpoints of the selected Tracks/Tracksegments with the corresponding times. 2sec / 10sec / 20sec / 1min / 1hour shows the best speeds over at least 2sec, 10sec, 20sec, 1min or 60min from all trackpoints of the selected Tracks/Tracksegments with the corresponding times . Play>, Stop, < Play, adjustable delay time, and Tracks can be used to replay or reverse replay of the trackpoints. The start timepoint has to be selected first by clicking into the lower right window (speed over time). If any of the result rows is clicked with the left mouse button, the corresponding trackpoints are connect by bold orange lines und the corresponding times are highlighted by red vertical lines in the lower right panel. Furthermore the corresponding trackpoints in the trackpoint list are highlighted. The display of the tracks is automatically scaled to fit the upper right window area, the Zoom factor can be adjusted by the mouse wheel or the + und - keys. The whole window content can be shifted by dragging with the right mouse button pressed or by using the arrow keys (press Shift & arrow keys simultaneously). In the lower right section the speed is display over the time. If one clicks with the left mouse button into this part of the window, the corresponding time is selected, the trackpoints are highlighted and shown as bold lines. The B- and N- keys can be used to jump the previous or next timepoint. There are several possibilities to define a certain measuring area (track) where for example the speeds of all competitors are evaluated and a ranking list is computed. In order to compute the average velocity between the gates the intersections of the trackpoint- and the gates-lines are determined (pink circles, see below). From the intersections the start- and finish times are computed by linear interpolation, assuming a constant speed between consecutive trackpoints. Finally the average speed between the gates is determined from the given tracklength and the time-difference. The really travelled distance is at least the tracklength and is shown in brackets in the result file (see below). If the gate lines are not crossed, if the course is surfed in the wrong direction or left between the gates, no results are computed. The gate positions, track length and width, magnification and shift can be saved to (Save Gates ...) and retrieved from (Load Gates ...) a text file. For the example data (pier in Grossenbrode-Germany) 119_150904.gpx there is a corresponding gates file (Grossenbrode500m.gts). When both gate positions are set, an evaluation of all trackpoints is performed and the result is displayed in the lowest part of the left panel. Again the average of the two best speeds and both best speeds with times are shown. Both gates can be reset by selecting Delete Gates. Finally the ranking list from several imported gpx-files can be displayed by selecting Show Ranking.The list can be saved for further processing with Save Results .... All evaluations (runs within the gates) and the ranking list can be saved as text file using this option (see below). There are cases where the maps are distorted by projection and have to be differently scaled in x- and y-direction. This can be done by using e.g. the freely available image processing tool `Irfanview´ (it can scale both directions independently e.g. x by 85%, y unchanged (100%)).